The ACS Committee on Analytical Reagents sets purity specifications for almost 500 reagent chemicals and over 500 standard-grade reference materials. ACS Reagent Chemicals provides general physical properties and analytical uses for all reagent chemicals as well as guidelines for standard analytical methods. 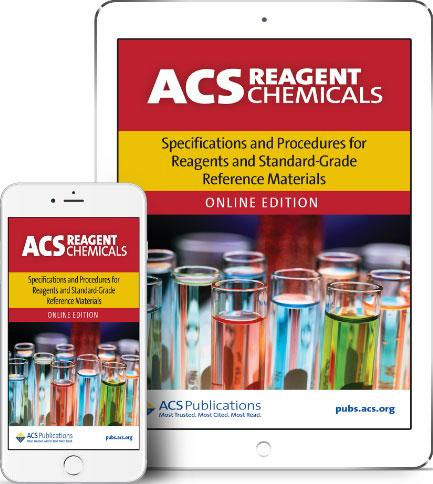 You can search ACS Reagent Chemicals in OskiCat or access it through the Chemistry and Chemical Engineering Library Guide under Properties and Data. Contact the Chemical Information Librarian, Kortney Rupp with any issues or questions. The 2018 Cambridge Structural Database System (including ConQuest and Mercury) is available for downloading from the UC distribution site. The Cambridge Structural Database is crystal structure database, with over 900,000 entries for organic and organometallic compounds. You must be on the campus network or wifi or using VPN to access the files on that page. Don’t forget the site and confirmation codes, which you can get by clicking Berkeley (UCB) link. You’ll need those codes during the CSDS installation. CSDS is available for Windows, OSX, and Linux/Unix. It is recommended that you uninstall CSDS 2017 before you start this installation. You can also search the CSD structures through WebCSD, without installing any software. What’s new in the 2018 release. Information about CSDS, including links to the specific databases. Please contact Kortney Rupp if you have questions about CSD. As a previous research chemist, I spent a lot of time populating laboratory notebooks during my undergraduate and graduate research. I used to pride myself in keeping what I thought to be a notebook in which the experiments could all be reproduced at any time (naive, I know). When I joined a research group in graduate school, my advisor told me we were going to use Microsoft OneNote as our group notebook. At first, I was confused and hesitant about making the switch. My natural my workflow and data organization had to dramatically change to adjust to the digital recordkeeping environment I now found myself in. I soon realized the transition would allow me to focus more on the science and less on the printing, pasting, and handwriting. As an atomic force microscopist, I found it quick and easy to import digital images, chemical structures and screenshots of methods directly from digital articles. Over time I developed new strategies for organization including color coding to tie together sample preparations with the corresponding AFM images. I also created file naming standards and table of content pages to allow my labmates and advisor to search my notebook easily. These strategies ultimately allowed me to conduct my work in a more efficient and easily reproducible way and I now cannot imagine a world in which I could conduct science using a paper notebook. Adopting any new workflows into an already complicated, time-sensitive environment can seem overwhelming and possess a steep learning curve. Libraries and librarians at UC Berkeley are well positioned to help researchers improve their productivity, transparency, and reproducibility by adopting a digital recordkeeping system. To try and provide some insight into how to determine which ELN to use and a strategy to make the transition to ELNs, I have created a guide and am available to assist throughout the transition process. Every year librarians from across the UC System come together to learn about emerging trends in library and information science at the LAUC-B conference. The 2017 theme was, “Focus on the visual: Digital Humanities and Libraries.” As the Chemical Information Librarian at UC Berkeley some people might wonder, what do I have in common with the digital humanities? I am an experienced chemist, but am a new librarian at UCB and have a lot to learn about the amazing work being done by my colleagues. The UC system supports many departments at the top of their field, so as you can imagine, the librarians for those departments and the entire system are often passionate and talented individuals. 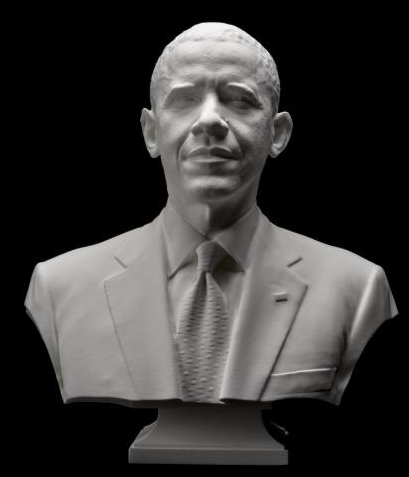 3D Printed bust of President Barack Obama. As a subject liaison, I feel strongly that interdisciplinary and collaborative projects are leading to some incredible outcomes, spanning across the humanities and sciences. My favorite talk of the day came from the Associate Vice Provost and Executive Director of the California Digital Library (CDL), Günter Waibel, who delivered the opening keynote and outlined his work doing the first ever 3D printed bust of a sitting President, which had a great societal response. As librarians we always hope our work will touch people in powerful ways, it’s still unclear to me what my contribution to the field will be. As long as I can attend events like the LAUC-B conference, I am sure to find a great idea. Reaxys is a web-based tool for the retrieval of chemistry information and data from published literature, including journals and patents.Chemists at Berkeley are active users of Reaxys, doing 1000’s of searches/month! An increasingly simple user interface. The opening page has spaces to (a) type in the search query in a search bar or (b) type in the name of the structure or draw the structure. Search functions using the querylets to increase the specificity of the search and reduces the time that the user has to filter the results post search. Listing hits in the initial screen (post search). No secondary search needed. The migration is Reaxys 2.0 is ongoing, but migration should be completed by November 30, 2017. Soon UCB users will be directed to the new interface, but will continue to have the option to use the old interface for the foreseeable future. Do you need a fast, easy way to access spectra and identify an unknown compound? Wiley Spectra Lab has acquired spectral data from Wiley, Wiley-VCH, Bio-Rad Sadtler and others to present the world’s largest collection of curated spectral data. Current licensing includes C-NMR, H-NMR and X-NMR spectroscopies. You can search Wiley Spectra Lab in OskiCat or access it through the Chemistry and Chemical Engineering Library Guide under Properties and Data. Contact the Chemical Information Librarian, Kortney Rupp with any issues or questions.